Looking for a spot to explore that will entertain all ages? With a four-year-old space enthusiast, we spend a fair amount of time at Clark Planetarium. Recently we had extended family in town and when we were looking for a place all eleven of us could enjoy together, we opted for the planetarium. The little kids love all the hands-on exhibits. My son was delighted to discover that he could touch the huge lightening globe, then touch me, eliciting a startling zap! 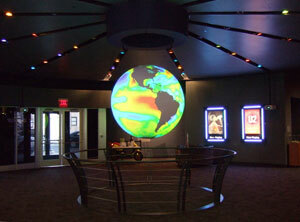 We were all hypnotized by the giant pendulum that steadily demonstrates the spinning of the earth. There were chances to find out how much you weight on various planets, a several stories tall exhibit of various chutes, levers, tubes, and gears that you can direct balls through, and places to walk on the moon and mars, or at least stroll through a very convincing, life-size diorama of them. Finally, after we had explored all the exhibits we had energy for, we sat down to an amazing movie in the dome theater. Screens all the way around! It&apos;s like Imax, but even better. My recommendation for a kid-friendly show is "Perfect Little Planet". Charming aliens take a tour of the solar system looking for the perfect spot to vacation. It&apos;s cute, entertaining and perfect for kids five and under, though entertaining enough for the adults too. Old viewers might enjoy the new movie about Tahiti or even the dinosaur show. They&apos;re all excellent and so fun to enjoy in the dome theater where you feel completely immersed in the show. 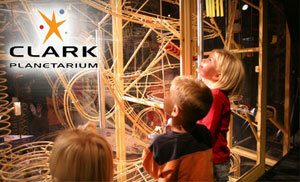 The Clark Planetarium is an excellent option for a mid-winter activity. And if you&apos;ve got a space-enthusiast like I do, membership is quite affordable and includes complimentary admission to the IMAX and dome theaters. 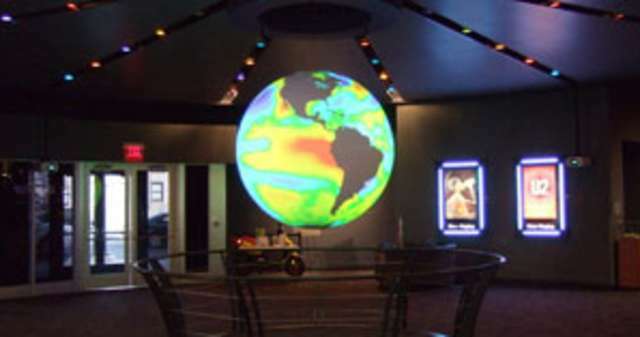 The Clark Planetarium is a featured attraction on the Visit Salt Lake Connect Pass. Read more from Amy Thompson at www.progessivepioneer.com.